The drop in the price of chili at the farm level to touch the level of Rp. 6 thousand / kilogram cannot be separated from the middlemen 's behavior. The drop in the price of chili at the farm level to touch the level of Rp. 6 thousand / kilogram cannot be separated from the middlemen 's behavior. Moreover, according to Ganjar, he found the facts if the market price of chili only dropped slightly. "Actually the price doesn't go down very much. But because the middlemen are mostly, so the price drops. I already checked in Ungaran yesterday, the price of curly chili in the market was Rp 20,000, traders bought it Rp 15,000, "Ganjar said on the sidelines of buying 10 tons of chili from farmers, on the yard of the Central Java Provincial Government on Monday (1/14/2019). But unfortunately according to him, middlemen bought chili from farmers at very cheap prices. That is in the range of Rp. 9 thousand to Rp. 7 thousand per kilogram. "It's the laughter of the middlemen, while the farmers continue to lose money," he said. Not only that, he also mentions if there is an irony that is quite intriguing. Namely, many farmers do not know the price of chilli on the market, so they are only oblivious when the middlemen buy at an unnatural price. Therefore, he wants in the future the farmer groups are required to install the Sihati application (Price Information System and Commodity Products), so that the middlemen cannot be deceived by middlemen. "So that farmers can know the price. For example, the price of chili is in the market of Rp. 20 thousand, while middlemen buy Rp. 7 thousand, do not want to, "he said. Ganjar also mentioned that he had checked in the field related to the drop in the price of chili which the farmers complained about. Apparently, the team found that the growing area of ​​chilli farmers was increasing, resulting in over supply. "That automatically makes the price not good. In addition to the wide planting area, the middlemen 's actions made prices plummet and farmers lost money, "he said. 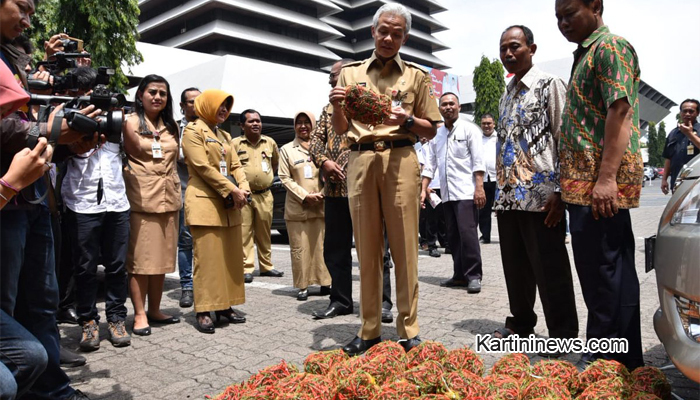 On that occasion, Ganjar brought in 10 tons of chili from farmers from Demak, Purbalingga and Semarang Regency. The chili peppers were then banned, and Ganjar also ordered the state civil apparatus (ASN) to buy chili directly from the farmers. The chili is bought at a price of Rp. 18 thousand / kilogram. With a transaction value of Rp 200 million more. The movement to require ASN to buy chili is welcomed by farmers. They claimed to be grateful, because they could sell chili at a price much higher than the price offered by middlemen. "The problem is that chili from farmers has only been valued at Rp 7,000 to Rp 9,000 by middlemen. With this program, many middlemen are shouting and there are price changes, "said Rohmat Budiono, a chili farmer from Purbalingga.